Bryan Brillhart Photography Presents Dig Imperial Beach "Bird of the Week", the "Royal Tern"
Bryan Brillhart of Bryan Brillhart Photography presents us with the Dig Imperial Beach “Bird of the Week”. 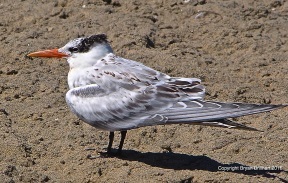 This week’s bird is the "Royal Tern (Thalasseus maximus)"
declined seriously in late 1800s and early 1900s when eggs were harvested from many colonies for food. These terns made a substantial comeback during the 20th century, but are still vulnerable due to loss of nesting sites. Populations have declined in California since 1950, coinciding with the decline in the population of the Pacific sardine. T ern also has a more plover like whistle that is longer, rolling and is more melodious. Habitat is on coasts, sandy beaches, and salt bays, favoring warm coastal waters, especially those that are shallow and somewhat protected, as in bays, lagoons, and estuaries. They are also found well offshore at times, and travel freely between islands in the Caribbean. They usually nest on low-lying sandy islands. 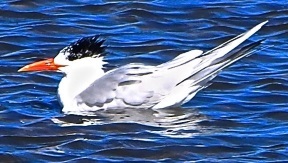 Royal Terns usually first breed at the age of 4 years. Nesting is in colonies. Courtship involves high spiraling flights by two or more birds. On ground, males present food to females; both birds bow and strut in circles. Nest sites are on the ground (usually sandy) in the open. Nests (probably built by both sexes) are a shallow depression, with or without a sparse lining of debris. Royal Terns forage mostly by hovering over water and plunging to catch prey just below the surface, sometimes flying low, skimming the water with their bills, they occasionally catch flying fish in the air, or dip to the water's surface to pick up floating refuse. They are known to steal food from other birds, and sometimes feed at night. Feeding mostly on small fish (up to 4" long, sometimes up to 7") and crustaceans, especially crabs, they eat a wide variety of small fish, shrimp, and squid. Soft-shelled blue crabs are a major item in their diet on the Atlantic Coast. After mating females lay one, rarely two whitish to brown, blotched with reddish-brown eggs. Incubation is by both sexes in about 28-35 days, but usually 30-31. Within 2-3 days after hatching, young leave the nest and join others in a group called a "creche." Both parents bring food. Parents and offspring are able to recognize each other by voice, so that adults feed only their own young. Age at first flight is about 4-5 weeks. Young remain with parents for up to 8 months or more, migrating south with them. 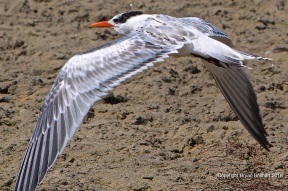 I spotted a large flock of Royal Terns this winter near the Tijuana River mouth. You never know what you will see there. Get out for a walk on the beach or on the many trails in the Estuary, and until next week, happy birding!